It's business as usual in terms of the moment-to-moment happenings, but it benefits from the altered structure that eschews multi-episode arcs in favor of singular experiences. For the first time in the series, I'm looking forward to continuing onward, if only a little. Though Minecraft: Story Mode really hasn’t pushed the graphic adventure genre to new heights, it’s another example of just how adaptable Telltale are when it comes to creating stories for other properties. Though Minecraft really doesn’t have a story, that fact simply gave them free reign to create a world and characters of their own, and the fifth episode’s standalone adventure is just another example of that, with more adventures yet to come. Order Up is the funniest episode to date and while it isn't the conclusion some people will be expecting, it does a good job of creating a fun and entertaining story as well as laying the groundwork for future adventures. With the series having seemingly ended one episode early, Minecraft: Story Mode Episode 5 picks things up extremely well, launching a new adventure while paying homage to the old. Many issues with the series have been touched up and fixed, though some still linger. Ultimately, this episode succeeds in telling its own story, while pushing things forward for what is to come. Minecraft: Story Mode settles into a new identity and story with “Order Up!,” one that isn’t beholden to past mistakes. Season One of Minecraft Story Mode ends on an all-time high with a highly amusing, and more importantly, fun standalone family adventure. The only drawbacks now are all related to Telltale’s own creaking game engine. Minecraft: Story Mode - Episode 5: Order Up! is the strongest individual episode in this series thus far. We say individual, because this is essentially a soft reboot of the season. Telltale's typical chapter-based story format just didn't work this time out, so an extended series of self-contained narratives may be the change that this spin-off needs. If these individual stories can maintain the level of intrigue in this instalment and build upon it, then we're interested to see what lies ahead. Until then, however, we remain sceptical – after all, the track record of this series isn't exactly on Telltale's side. Order Up is not an epilogue for the first season of Minecraft Story Mode: is more a beginning for the second one (and in fact three more episode have been announced). The central part of the adventure is quite ordinary, but the new Sky City is a great location and the return of old characters works well in the funny script. With the series now essentially moving into a new “season,” Minecraft: Story Mode has largely shaken things up a bit with a whole new area of its blocky, build-it world and some new faces alongside its older ones, while at the same time keeping its charm and good humor intact. While the supporting cast are still not quite getting the same level of attention or character development as some of the series more prominent actors, “Order Up!” still brings in one of the series’ best episodes to date, and builds up to a whole new adventure with three more episodes to see how the blocks all fall into place. After some uneven execution in previous episodes Telltale finds its footing in Minecraft Story Mode Episode 5: Order Up! by delivering whimsical storytelling that’s more in line with the source material plus a touch of seriousness that doesn’t feel forced. The result is a more fleshed-out episode that’s more entertaining and arguably the most enjoyable in the series so far. 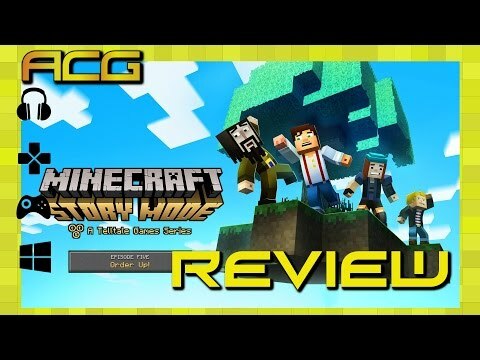 It remains to be seen how well the story format introduced in Order Up will work in the end, but its more self-contained plot and ideas still make for a quality episode of Minecraft: Story Mode. Although still intended for kids, the beginning promises more creativity. A refreshing change of pace in an era of serious gaming and consistent across all five episodes, Story Mode offers a laid-back adventure that’s accessible to any type of gamer. Order Up kicks off a new journey for the Order of the Stone with another solid, enjoyable effort, with more than enough humour and direction to keep you interested in what’s to come from the next three episodes. Episode 5: Order Up! is certainly the strongest episode yet, but it's not exactly terrific, especially given what TellTale Games is capable of producing. The lack of real Minecrafting (yes, that's a word) clashes with the core of what Minecraft is, forcing puzzles to be solved rather than walls blasted through? It's Minecraft by name to shift more copies, which is disappointing, and looks somewhat mundane when compared to the open world survival game. The writers at Telltale quite obviously ran out of juice after four episodes, leading to this “in between” episode that leaves a bad taste in my mouth. 'Minecraft: Story Mode - Order Up' is a return to form for the series, which has been struggling a bit in narrative heft the last few episodes. The witherstorm probably went on longer than it should, but it was a serviceable origin story for the new Order of the Stone. 'Order Up' seems more like a new season than a fifth episode, and I think that will end up being an advantage as we move forward.